Word Balloon The Pop Culture Interview Podcast: Jen Van Meter Strikes With Black Lightning! Jen Van Meter Strikes With Black Lightning! http://media.libsyn.com/media/wordballoon/WBjenvanmeter09.mp3 On this edition of the Word Balloon Podcast, we speak with writer Jen Van Meter. In Dc Comics Bi-Weekly Mini series Black Lightning Year One Van Meter and artist Cully hammer flesh out the early career of the Suicide Slum hero. 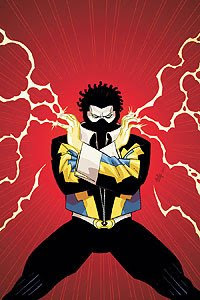 Black Lightning debuted in April 1977 by Tony Isabella and Trevor Von Eeden. Jen goes behind the scenes,discussing how she has connected the dots of Jefferson Pierce's complicated continuity. How did the street fighter of the 1970's become the button down family man and husband seen in today's stories. We discuss her collaboration with Hammer, and her writing process for the project, including layered insight in Jeff's home life. We hear updates on future Van Meter creator owned series from Oni Press including a new Hopeless Savages story.